Dreaming of spending your honeymoon in Reunion island ? Iloha welcomes you in a tropical paradise, with a panoramic view over the bay of Saint-Leu. 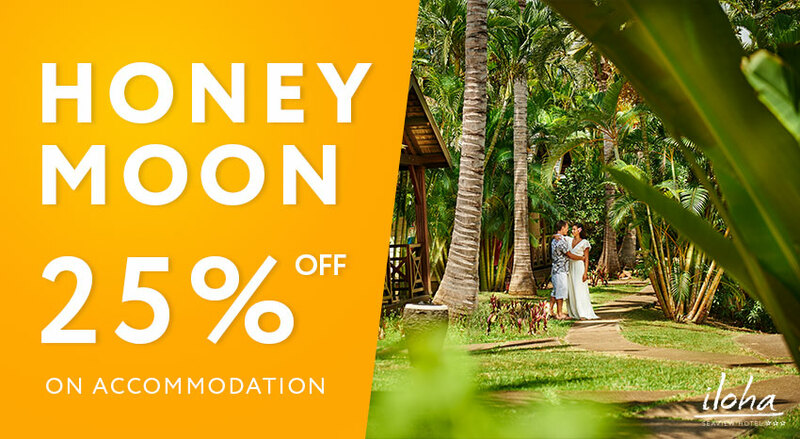 The charming rooms and bungalows, beautiful lush green garden and authenticity of the area make a perfect destination for those wishing to spend their honeymoon in Reunion island. For your honeymoon stay*, we are pleased to offer you a discount of 25% off your accommodation. This offer is valid for any a minimum stay of 5 nights, booked in tropical bungalow. Offer valid for any 5 night-stay or more in tropical bungalow. > Offer applicable upon presentation of a wedding certificate not exceeding 1 year from date of issue. We offer you a discount of 15% off on your wellness treatments and personalized gifts. For any stay with half-board, a romantic dinner is suggested.